Tide win first-ever match in Utah! Chase Tangney (yellow) helped TFC make history in Ogden last night. It took three years and five matches but Tacoma Tide FC have secured their first-ever win in the state of Utah after a hard-fought 1-0 victory in Ogden over the Outlaws. The first road victory of 2008 moves Tacoma ahead of the pack and alone in first place in the PDL NW Division with 19 points and a 6-2-1 record. Yakima Reds lost 2-1 last night in BYU to fall to second place. The Tide boarded their plane at Sea Tac Airport earlier in the day and then made their way to Ogden for the encounter. Earlier this season Tacoma had won a one-sided 5-0 gunfight at home over the Ogden outfit and were riding a 5-match unbeaten string built from their home dominance. The match-winner came in the 63rd minute from forward Chase Tangney. Tangney continues his red-hot scoring pace after netting two against Vancouver last week. He now has the match-winning goals in two straight Tacoma matches. The Outlaw Nation Blog has this report and promises photos later. Tacoma out shot the home team 13-7 and earned more corner kicks 4-1. Daniel Scott, Machael David and Tucker Maxwell received yellow cards for TFC. 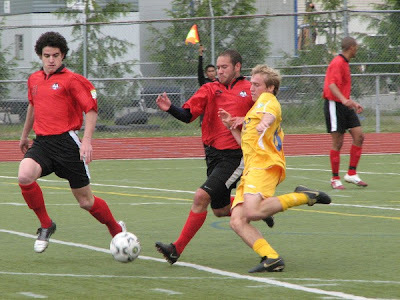 The Outlaws' defender Alexander Bernier was ejected with a red card in the 88th minute. Tacoma goes for more road points tonight as they move south to Provo to face the BYU Cougars. TFC have yet to ever earn a point at the Cougars' home den.